Special release week price of $2.99 and Free in Kindle Unlimited. I’m a sports romance junkie; it doesn’t matter the sport or the level of competition…this tomboy just loves any and all story lines, whether they’re in the forefront or the background, that include the wide world of sports! 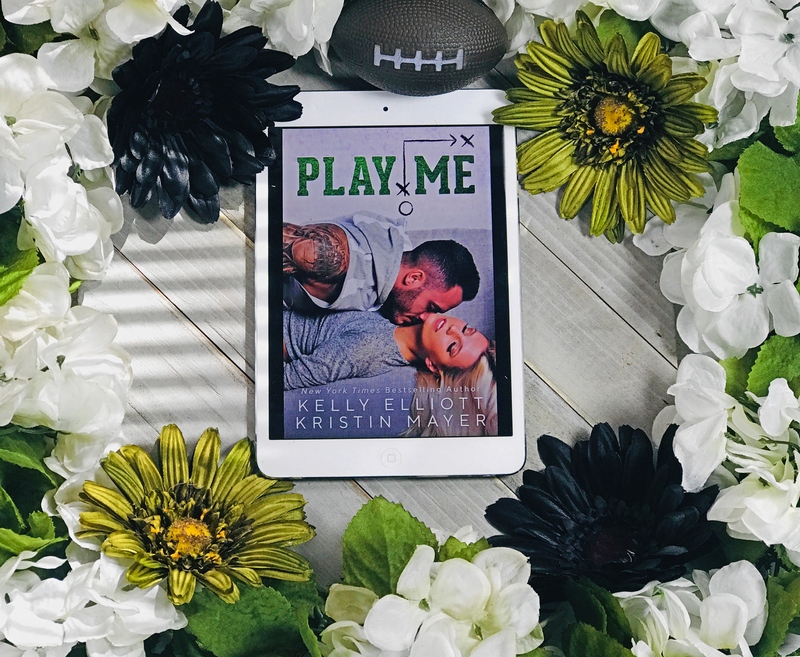 And, that’s exactly why Play Me by Kelly Elliott and Kristin Mayer was a no brainer ARC read…add to that the fact that the premise included an intelligent, driven, and more than qualified female general manager for a minor league football team who knows the game of football and has the determination to succeed…and then there’s the hero – an alpha male and a gentleman who is all kinds of swoon worthy and that makes Hunter and Kendall’s story a MUST READ! There’s a bit of a love/hate relationship between Hunter and Kendall at the start, which makes sense given the fact that they’re stubborn as heck, and both are used to calling the shots. But it’s beyond clear from the start that these two have off-the-charts chemistry and will eventually give into the sexual tension surrounding them…it’s just what happens when lust and desire turn into something more…something scary, at least in Kendall’s mind, that they’re going to have to figure out because one playing offense and one playing defense when it comes to their hearts will never end in victory but rather something even more devastating than defeat. There’s so much to love about Hunter Owens; he’s definitely the complete package and then some;) He can sweet and dirty talk with ease and the way his presence commands attention is something to behold. BUT, it’s Hunter’s resilience when it comes to one of the Mustang’s players that stands out above the rest. He never stopped trying to reach Josh…no matter how many times he messed up, Hunter kept his faith in Josh and some of the most powerful scenes in the story are the ones where Hunter works to understand Josh and make Josh see the player and the man he can be if he gets his act together. Regardless of how strong and feisty Kendall is in her general manager position, she’s still a woman in a male-dominated profession, which means that every action she takes and every decision she makes is scrutinized by the Board of Directors, by her employees, and by her players. She can’t show weakness or it’s used against her, which means Kendall has to walk a very narrow line because it seems like everyone’s waiting and expecting her to fail. And it’s those burdens that made it easier for me, even though she did frustrate me a bit, to understand her perspective when it came to her feelings for Hunter and her need to prove herself in her career. Hunter and Kendall’s parents added so much to the story line and Elliott and Mayer did an amazing job of illustrating just how important these relationships are…how much their mom and dad ground both Hunter and Kendall and help them to realize what’s most important in life, making sure that their lives are filled with more than just a job they love. Their bond is so essential to all of their lives and that idea is shown in every private discussion, every declaration of love, and every father/daughter, mother/daughter, father/son, and mother/son interaction. Play Me is a sweet, steamy, sassy, and heartwarming story that focuses on the importance of balance in life and in love as well as the supportive bonds that are absolutely necessary for coping and enduring. Hunter and Kendall grow so much individually as well as, as a couple as they learn to adjust to changes and to revel in all of life’s precious gifts. I enjoyed this book so much, and I cannot wait for these two authors to collaborate for another romance read!